The dog wears a forlorn air in these pre-Summer break days. We have a theory: we believe he is missing the cat, who died a short while ago leaving an angry tortoiseshell-shaped rent in the fabric of our existence.The house has become relaxed, unchallenged, unconfronted. It’s agressometer is running on empty. This foxes the dog. The tension of the cat’s fury was the thread which embroidered the shabby hearthrug of his life. He is simply adrift in a sea of listless calm. And what better way to introduce angst to the dog, than by turning him into a railway commuter? Yes: circumstances dictate that on Saturday, when the household repairs down to Cornwall, we shall do so in two halves. Maddie and I shall take the car. We shall go indecently early to avoid the first-day-of-the-holiday rush, departing at 6am and arriving in Exeter in time for those lavish shops to open, and an early jaunt around the cathedral. Felix gets terribly carsick, so Phil and Felix will wait until later. They will walk the dog around the forest, and then they will make their way to the station, trailing Macaulay. And they will board a train for Exeter with a dog in tow. Macaulay the dog will spend around three hours on the fast train to the English West Country. He will travel in a luxury unheard of by his doggie predecessors. According to a superlative source in the rail enthusiast’s blogging world, Turniprail, dogs have been accompanying their owners on trains for a very long time; but not necessarily comfortably. 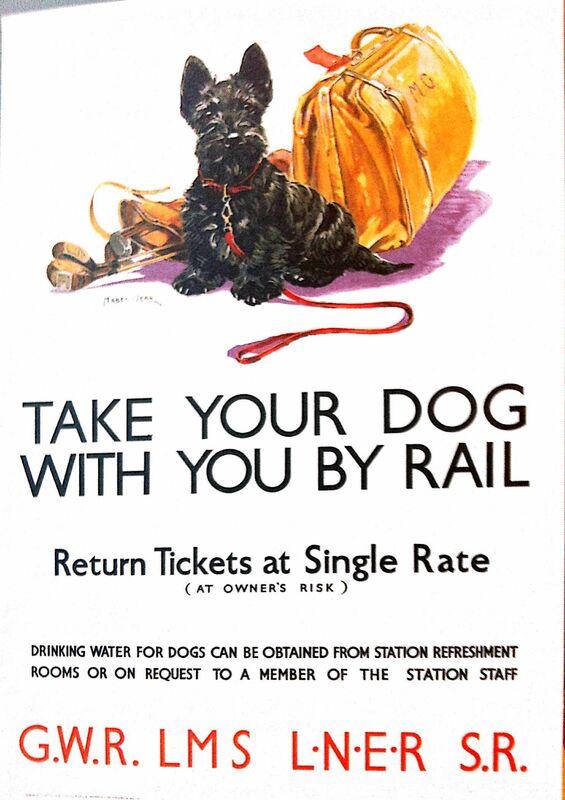 In the early days of rail, tickets were purchased by owners for their dogs, which had the owner’s name written on them. On September 11th, 1846, a Mr Wallop was on his way home to Gosport from a day’s shooting, when he was apprehended for firing his gun out of the bally first class carriage window. Dashed irresponsible: what if his faithful gun dog had followed the volley out of the carriage? As you would expect from such a gentleman, he refused to give up his name: but he was required to show his dog’s ticket. Which had his name on it. Perhaps Mr Wallop was not the most incendiary ammunition in the barrel. During the 1850s, Turniprail records, a court case concerned an incident in which man’s dog managed to escape from the rather cramped conditions available for our best friends at the time: dog boxes, stashed under second class seats.Nobody wanted to do this to their dog, it seems. Romey’s Rambles on Railways records ladies who hid their dogs in shawls, and in hand baskets, and one man who hid his dog in a carpet bag. The Kennel Club got their teeth into the issue and by the twenties, regulated, clean dog boxes were available, to transport our best friends in comparative comfort. Past pooches may have faced a battle for doggie rights; but Macaulay will travel free of charge at the feet of the Shrewsday men. Let us hope his journey spices up his life to the required degree. Posted in Macaulay The Dog storiesTagged dogs, pets, railways, travel, turniprailBookmark the permalink. Thanks, Wanderlust 🙂 Mac is about to go on his own parochial wander. Poor Macaulay – no cat to scare him. I do hope he enjoys the train trip, it should give him something to dream about on sunny afternoons. This is the Shire, Sidey. We’re all hobbits here. The books sound pretty much as though he used the English countryside and woods as much of his inspiration, yet there they were, in the flesh, in New Zealand. Ah, life goes on, Gabrielle. I’d be really interested to hear whether dogs can take a train in your neck of the woods! No!!!!!!! No animals allowed on Queensland Rail unless it is a seeing eye or assistance dog – dog discrimination – I will bite them on the bum! I will growl them out of town! I will howl and bark and gnaw and snark until they let me on – woof! Great stuff, Kate. Particularly loved this sentence “The tension of the cat’s fury was the thread which embroidered the shabby hearthrug of his life.” Perfect. Have a lovely hol. Look forward to reading your reports! Thanks, Jan. You going away? I remember our exodus to Dartmouth every August, when the children were young. I would drive down with my son and the other sun would shine. We would ring home, on arrival, to say how fabulous it all was. My wife, daughter and assorted friends would arrive by train the next day under a leaden sky. The next three weeks were filled with rain and occasional spells of sun. I look each year, in August, at the weather maps showing Dartmouth. Dartmouth is easy to spot as there is normally a jagged shaft of lightening just above the name. It does get its fair share of rain, Roger 🙂 Let us hope that this year things will be a little different! Happy hols to all of the Shrewsday family – hoping that the sun comes out for you all. I am curious – what happens to a doggie on a train who needs the loo? Some swift negotiation with the guard, Rosemary 😀 Caulay is used to being home alone for spells of up to four hours and the journey’s less than that. So here’s hoping…. I’m surprised that they don’t have the dog under lock and key, the fuss that most train companies make about suitcases and bicycles and wheelchairs. Have you had to book him ahead? You’ll have to let us know how the journey goes, I’m most curious for I’ve never seen or heard of a doggy taking the train. Not these days anyhow. I am left wondering about young Master Felix and his penchant for car sickness. Perhaps the openness and gentle rocking of the train is the cure. I am sure Macaulay will enjoy the luxury of the royal coach ride. I thought that a new cat has joined the clan, is that not yet the case? Have a safe trip Kate and a good break – any train tales will be greatfully received. I have my intrepid reporters Felix and Phil armed with a camera, Jim! Safe travel to all; man and man’s best friend. I love the sound of the rail – and the thought of Cornwall. It is interesting, is it not, that those of us who suffer travel sickness suffer this sickness only on certain modes of transport? I can’t look down at a map even for a moment on a coach or in a car, and don’t even mention boats….but can read a whole novel in a train without a problem. Poor Felix. I assume you have tried many remedies? Manymanymany, Pseu. He’s ok to travel but dreads it. We figured, why not make it into an exciting adventure instead? What a totally beautiful song, Brett. And the animation is gorgeous…being, as it is, in a forest. Makes one feel better immediately. Thank you. My dog is the same with my son.. he loves him dearly and it’s because he enjoys annoying him. It’s their form of play I guess! xo Enjoy your journey!! Thanks Smidge….or may I call you Barbara? Dogs and boys. An unbeatable team. Ah, Cornwall. One of my dream destinations on earth. Someday. I hope you will post tantalizing photos and have blue sky days, Kate. Mac is a lucky little fellow. Oh, how civilized! I sadly recall the days when I would spend much of my two-day train journey from Johannesburg to the Cape in the Guard’s Van, keeping company with my Alsatian companion. I hope you haven’t misread the enlightenment of BR! What a wonderful country–you can travel by rail AND take the dog along. Have a happy holiday. We shall, Kathy, thank you! Yes. That thought had crossed my mind, Amy 😀 Wonderful Occupy today. You have set me thinking. Seems to me there’s a lot of second peace out here in cyberspace. One of the great pluses of the Internet. I thought my computer was dead the other day. Withdrawal was not pretty. I watched a TED talk given by a man who is with the police. The monitor and capture the criminal side of the internet world. He told how these horrid people are three jumps ahead of the rest of the world most of the time. When sci-fi movies are made, the criminal faction jump on the idea and create it because they have so much money and no rules. Yike! If you want I can have a talk with him. What’z his email addie. Elvira, he is not a tech dog. His befuddled brain is trapped, for some reason, in the twentieth century. The rail I travel most frequently is the subway which is not welcome to pets, but occasionally commuters have smuggled on their hounds. Then, there is a rare sense of solidarity amongst us jaded New Yorkers as we fawn over the furriest of faces. Gotham City is a very pro-dog place. Macaulay would feel welcome in the Big Apple. Have a great getaway. There: now I shall simply have to spend a couple hours googling dogs on the NY subway….they have a habit of bringing the hardest hearts together. Except the smelly ones. Thanks, Angela. I am having to rely on my two intrepid reporters, Phil and Felix, as Maddie and I shall be engaged on VERY important shopping business 😀 They will have a camera though. Thanks, Tandy. We will report back. My dog would want to hang his head out the window. Great story. Have a great time. I’m sure Macauley will love it. Why is he not going in the car? We intend to shop with some seriousness, and will be wafting round the cathedral and museums, Tilly. The dog would not be impressed to be left in the car for the duration of our stop. Lucky Mac! Our two must stay with my parents while we’re away this week. They are reduced to low end of the pack there. Dogs three and four of four is not their preferred place in a hierarchy. That’s hard- Mac often has to do it with our extended canine family – but they usually slip quickly into place, don’t they…hope the hols are proving restful! Beautifully worded Kate, good to know you are arranging to patch that rent. There was almost no alternative, Madhu. Mac had begun to worry at his fur, and was sporting bald patches. He’s a sensitive soul despite that wiry exterior. Your men are brave, Kate – I can see Macaulay’s whiskered curmudgeonly brows, windswept and twitching in manic delight as he hangs out the carriage window sniffing a million strange and enticing smells. Glad Macaulay has company and hope there are lots of interesting things under the seats to nose around. Dear Kate, I hope that Macaulay takes to trains and doesn’t get “train-sick.” Peace.